I am interested in upgrading the intake on my car and have been looking into a few options, 1st the OBX ITB, which is very nice sounding and cheaper then the 2nd, skunk2 intake mani and throttle body, plus would need a decent cai... Just wanted to here some opinions....? how much research have you done on successful ITB set ups? OBX is hit or miss (from hands on experience AND numerous reviews from other consumers), so I sure as hell wouldn't use their ITB's, but that's just me. You couldn't pay me enough money to run anything OBX on either of my cars , especially something as complicated and something that requires so much R&D and engineering as ITB's. Word. I wouldn't even trust them with lugnuts. I think a lot of people like to bash products. Any itb set up you choose will not be a simple bolt n where as the skunk2 pretty much will be. True that obx is not a very big reputable company but you have to start somewhere right? The bottom line is the people who say its crap without trying it you can't listen to them because they are all hear say. If you feel optimistic about it, go for it. Bad reviews on Coke and Meth from people who haven't used them aren't enough to keep me from trying them, I have to see for myself how bad they really are. I've used OBX products before, and I never will again. Poor quality and ****ty customer support is all I ever got from them. I prefer to give my money for companies that do their R&D on their products instead of giving it to a company that just rips other companies designs off and markets them as their own. But what do I know, it's all just "hearsay" I guess. what product did you use? what was wrong with it? what did it damage on your car? pics? support your statement, not saying by any means you are wrong but i think a few of us would like to know exactly what your talking about. coke and meth are a little different than car parts that some people have had it work for them, just saying..... and i have yet to see any reviews with pictures and showing the problem. its like one little negative word from some guy with 457,398,874 posts on a forum got out and then the train begins. I used their extended wheel studs...or I tried to. The quality of them was horrendous. I don't know what they were made of but when I threaded my brand new lug nuts on them, it was fine, until I went to the remove them a few days later. The threading like, literally came off with the lugs and I had to replace the wheel studs with OEM units. 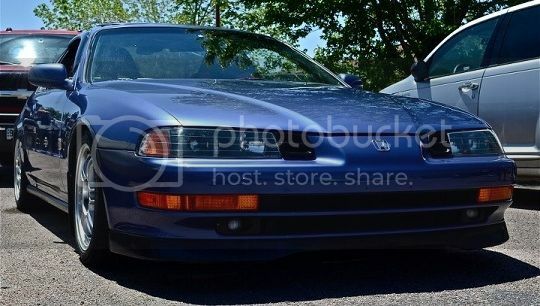 Also, my first Prelude had an OBX muffler on when I bought it. I bought the car from a friend and he had put the muffler on about 6 months before I bought. About 3-4 months after I purchased the car, the the shiny luster on the muffler was gone, it was beginning to rust, and one of the welds was so ****ty, the muffler literally started to fall apart. Keep in mind this was in the fall, so there was no snow/sleet/ice/salt to help in the deterioration of the piece. That's my 2 cents on OBX. Take it for what you will. wow!! ok, so now we know not to use the OBX extended lugs. and as for the muffler, they must use a really sorry metal huh? and was this recently or a few years back? Who might that person be? Because there are plenty of people who will not use OBX products for a reason, their cams eat rocker arms why trust a company that makes those products for anything else. and was this recently or a few years back? Lugs was last year, exhaust problem was 3 years ago. And I would never TOUCH their cams, I don't give a **** about hear-say, there are way too many horror stories out there about their cams. So far their lugs, exhaust, and cams are crap and you are going to trust this company to make your ITB's? and there you have it... see was that so hard? thats what i was talking about all along, give facts, not opinions. that is why people really ask questions. i just dont like people being harsh for no reason. what ever happened to lending a helping hand in the FIRST place?? not just coming out swinging with a f*** you attitude.... but, i too, would never use an OBX internal but, people on HT had positive results with the ITB set up? possible that it could be useable??? Idk, maybe. I don't think it was really a "**** you" attitude, I just think it was tough-love in the form of "Don't be an idiot, spend a little more on quality products and skip the OBX crap." If you're not going with boost, don't get the S2 manifold. If you're not going with tons of headwork, don't go with the OBX mani or with ITBs period. If you want an upgrade from stock, go Euro R or Blacktrax. quality itb's cost a ****LOAD. seriously, you could buy a car. 700 bucks is a steal but i wouldnt use obx. at all. yeah, its something alot of people dont do, but unless you are going to track it, i wouldnt waste my money on itb's. alot of work and alot of tuning. if you want streetable n/a power from a dd, just go euro-r. right around the same price, and made by a fellow luder. who knows his ****, and the craftsmanship is second to none. I have some OBX headers stainless no rust and I felt a difference in performance as well.. I seen plenty of good results on the LSD diff as well... Skunk2 cost but at least you won't have a guilty thought about something breaking on your car..